Roasted Artichokes with Saffron-Meyer Lemon Aioli - A recipe from Savor California, the online showcase for extraordinary gourmet foods and beverages from California. Trim the tips of artichoke leaves, cut off the stem at the base and cut off approximately 1” of the tops. Bring a large pot of water to a boil with olive oil, dash of salt and lemon juice. Boil the artichokes until tender, approximately 30 minutes, drain and chill. Preheat oven to 500F, and melt butter in a heavy pan or case iron skillet until butter foams, set aside. Cut each artichoke in half, and using a teaspoon, scoop out the center leaves and choke. Place the artichoke halves cut side down in the pan of butter without overlapping. 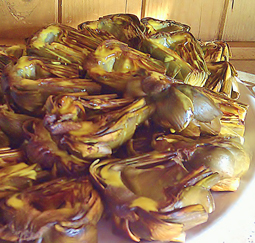 Roast the artichokes in the hot oven for 15 minutes or until the cut side is well caramelized. Meanwhile, to make the aioli, place all the ingredients in a blender except the oil. Turn on the blender and slowly drizzle the oil in a stream until it is completely incorporated into the emulsion. Taste for seasoning and adjust as needed. Refrigerate until ready to use. Serve the artichokes cut side up, drizzled with the Saffron-Meyer Lemon Aioli.